This is how we handle our plumbing and heating in our truck. It’s not meant to be a definitive guide as to how it should be done, but this does work for us. Heating wise, we have 2 ways to heat our water. 1. It’s heated by the engine as we drive. This is done by cutting the heater feed and return pipes to the heater in the cab, and inserting T pieces in them. Tee piece in the pipe going to the cab heater. On the Mog, this pipe is 19mm Inside diameter. This gives a source of hot engine coolant, and a place to return it to. This then flows through 2 pipes back from the engine bay, under the camper body. One pipe then is connected through an Eberspacher water heater,many the coolant just flows straight through it. From there, they go back to 2 small radiators (heater elements from cars in a scrapyard I suspect, I did not put them in myself.) From there they go to a calorifier, which is pretty much the same as a hot water tank in a house. This is where the engines heat is used to heat the water. Our calorifier has about a 30 litre capacity. 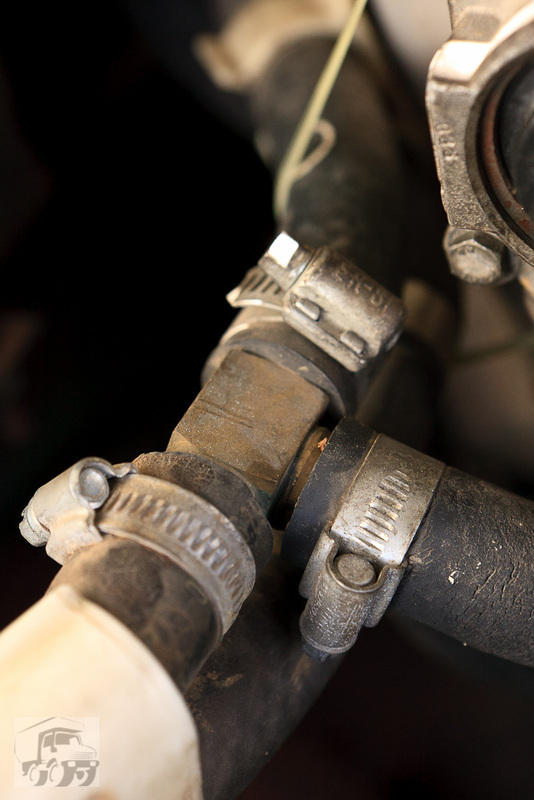 This created a new issue, as the plumbing in the camper body is higher than the header tank used to fill the cooling system. So, we put on a very high pressure cap on the header tank in the engine bay, and then fitted another one under the seats in the back which has the real pressure cap. it’s plumbed into the same circuit, and is the one I use to fill or top off the cooling system. 2. If we do not drive for a day,or need a second tank of hot water, we can switch on the Eberspacher heater. This uses diesel from the second diesel tank (we have 2). This then heats the coolant, and circulates it to the calorifier and the engine. This means it takes quite a while to heat the water, but it also means that on cold mornings our engine and cab heater is hot and ready to go. As it’s an old truck, the engine does not have glow plugs, which all modern diesel engines have, and therefore all help on cold mornings to get it started is appreciated! These heaters can be got in Ireland from a company in Naas called Cold Chain. We did have a problem with our unit due to too many restart attempts. We got it sorted in Europe easily enough. There is also a black radiator (small domestic one) mounted horizontally on the roof that has its own pump to circulate water through to get some solar heat into the water, but it doesn’t work very well, in fact, hardly at all. While this hot water is circulating, we can switch on fans to blow air into the camper through the 2 small radiators. This gives us a source of hot air to warm the camper on cold nights or mornings. in really cold conditions, we leave these fans turned on all day as we drive, which turns the whole camper into a hot press! Great for drying clothes as we drive, provided we leave a roof vent open to get rid of the damp air. Our water tank can hold 330L of water. The filler for this is pretty high up, so we need taps with decent pressure to fill it in a reasonable timeframe. This water goes to the Shower, the outside taps (at the back) and to the Sink. At the sink, there is a feed to a “Nature Pure” filter, and from there to a drinking water tap. Our shower does not have a separate room, instead it is just inside the door. When we are not using the shower (which is about 23 and 3/4 hours per day) we have a cover that goes over the shower tray that matches the rest of the truck’s floor. The shower curtain goes around 3 sides of you, and when not in use is rolled up and tucked over the shower head. There are a few photos of the unimog shower here. We have a “porta-Poti” chemical toilet that is on a sliding drawer that comes out from under the bed. Sounds weird, but means we do not lose a complete room to a bathroom that is not used all that much. Photos of where it goes are on the Look inside Moglander page.